The rules a wargamer will use are a very personal thing, and this state of affairs has always been a fundamental part of our hobby. Donald Featherstone noted in his 1962 book War Games that "there are almost as many rule books as there are war gamers". 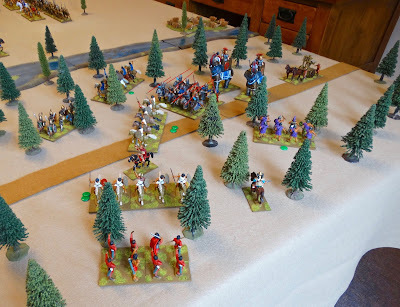 The choices made may simply involve which commercial set you use, but depending on the type of wargamer you are they may extend to personal amendments applied to a commercial set. Those unsatisfied with commercial sets may go further and write their own rules. The latter course is one of the most creative choices a gamer can make in what is, at its best, a creative hobby. Thus I was very pleased to be contacted by my friend Roy, offering to try out a Kings of War Historical game with myself and Stuart C, the leading light in the Cirencester Wargames Club. The three of us could pool our ideas and opinions and I could increase my understanding of the rules. 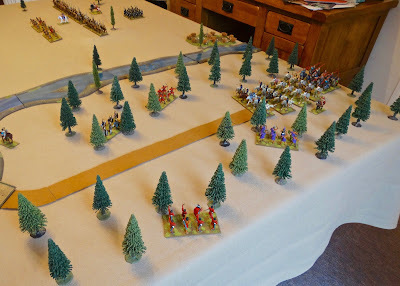 Stuart plays Fantasy games with the original KoW rules and also plays the Historical set, so he would be able to shed some light on the background to the rules as well as their strengths and weaknesses. Roy kindly acceded to my request to bring over my own newly re-based figures for the try-out. Re-basing of some sort is an issue for KoWH, as they have a simple but fairly uncompromising basing scheme (see my first post on this subject). However, some sort of collective or 'sabot' basing seems to be the answer - in my case done permanently, in Stuart's with temporary bases which allow him to continue to use his figures for Armati. As we all know, ask 3 wargamers their opinions on a rule set and you'll get at least 4 answers. 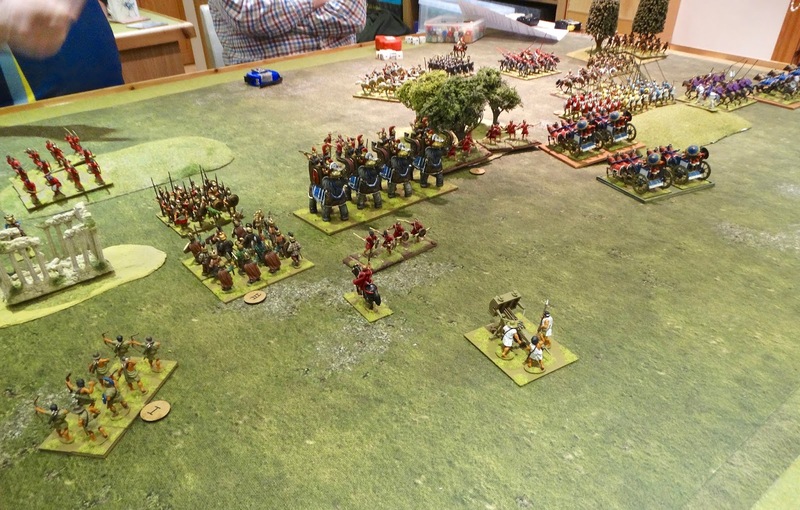 Stuart had delved into the background of the rules and was sensibly keen to use them pretty much as written for a basic playtest. This we did, and Stuart was obviously content to accept some aspects which seemed a bit unhistorical, whilst adapting his play to the possibilities of the rules. In other words, he accepted the rules as a game to be enjoyed. I was enjoying the game as well, but constantly looking at what amendments might be made without bending the rules completely out of shape. Roy cheerfully went along with the game but it was obvious he too had his doubts about how the rules represented ancient warfare. The initial set up. We used one of the scenarios from the rule book. Stuart's elephants start to break through my lightly held centre. The bolt thrower prepares to play the role of 17pdr anti-tank gun against the elephantine Tiger tanks. Now That's What I Call A Melee - 1. My right flank meets Stuart's left, under Roy's command. Now That's What I Call A Melee - 2. Heavy chariots vs. elephants. I think I heard an historically-inspired 'Harumph!' from Roy at this stage. I should acknowledge here that Stuart and Roy won decisively. 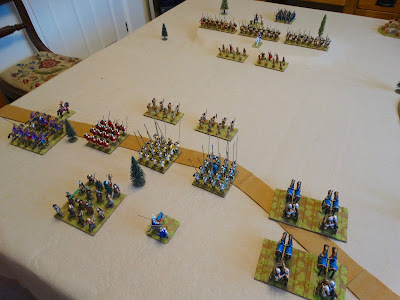 The really interesting thing for me is that, having thought carefully about Stuart's explanations and information, I decided to rudely ignore his approach of leaving the rules alone and enjoying them as a game, and continue with my own amendments exactly as before. That's wargamers for you. To give my thoughts another run out, I set up a solo game at home shortly afterwards. 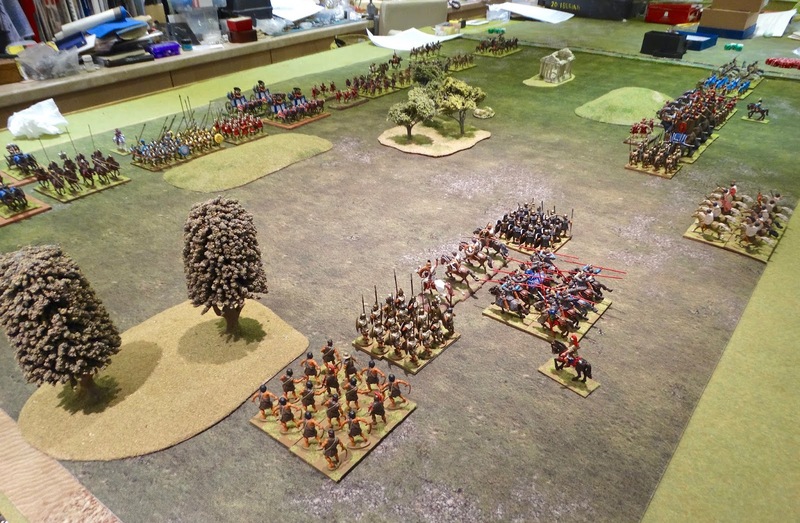 This was based on a scenario contained in Wargames, Soldiers & Strategy 75, called 'A Fickle Flanking Force'. The author, Steve Jones, publishes scenarios in various magazines from time to time and invariably comes up with something interesting. Using this scenario was part of my determination not to have my ancient games fall into the rut of just lining up the armies opposite each other along opposing baselines, usually with little or no terrain. The clever part of this scenario is that one ends up having 2 games going on at the same time, each linked to the other. 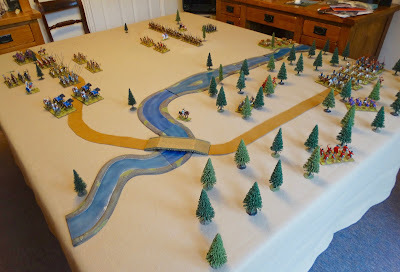 As the first photo shows, the table is divided by a river. The 'main' battle is seen in the background of the photo - one side holds a ridge against a slightly superior attacking force, tasked with breaking through their line. 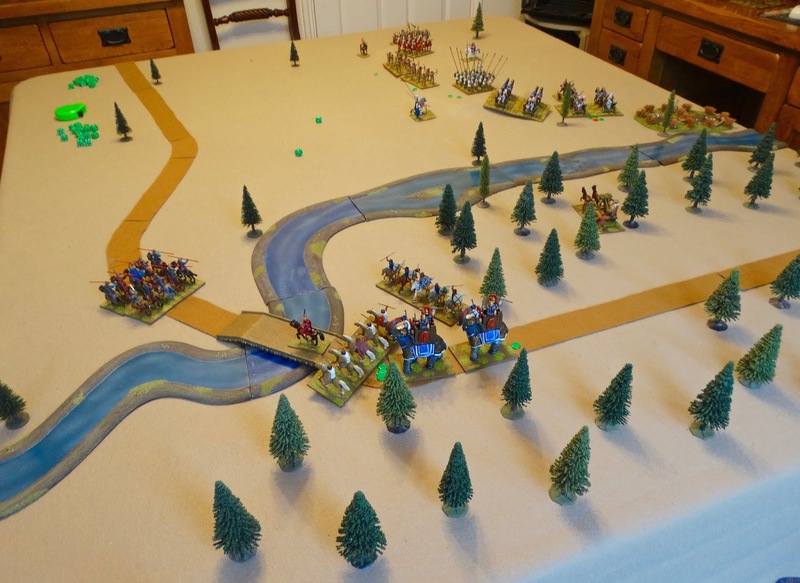 On the near side of the river, allies of the defenders are advancing through a wooded area with the intention of crossing the bridge and attacking their comrades' tormentors in flank and rear. 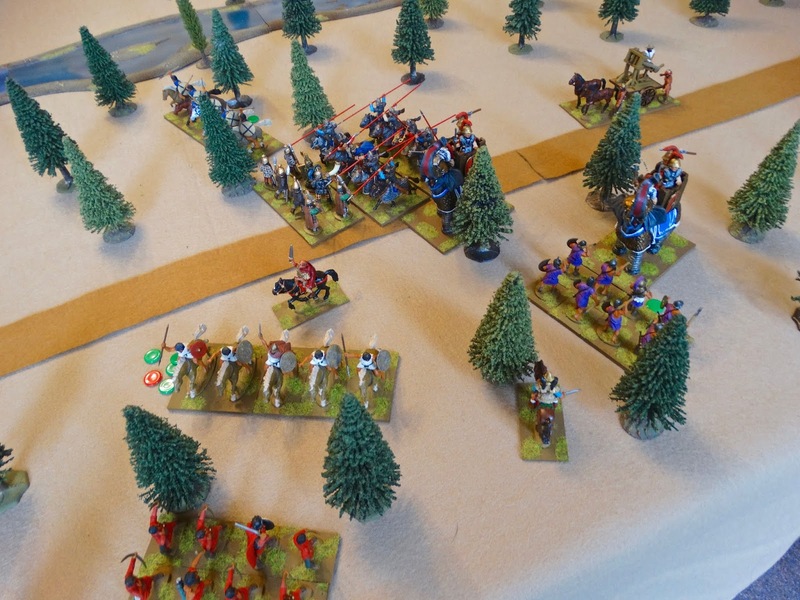 This flanking force is in turn about to be ambushed from the woods on each side of the road. The ambush - opening positions. Light forces from Paphlagonia haunt the woods. 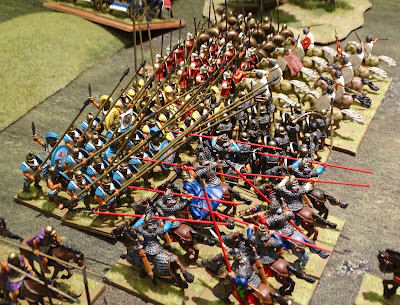 The flanking force is made up of cavalry, elephants and a carro-ballista. The Paphlagonians hurry forward to attack the ridge. 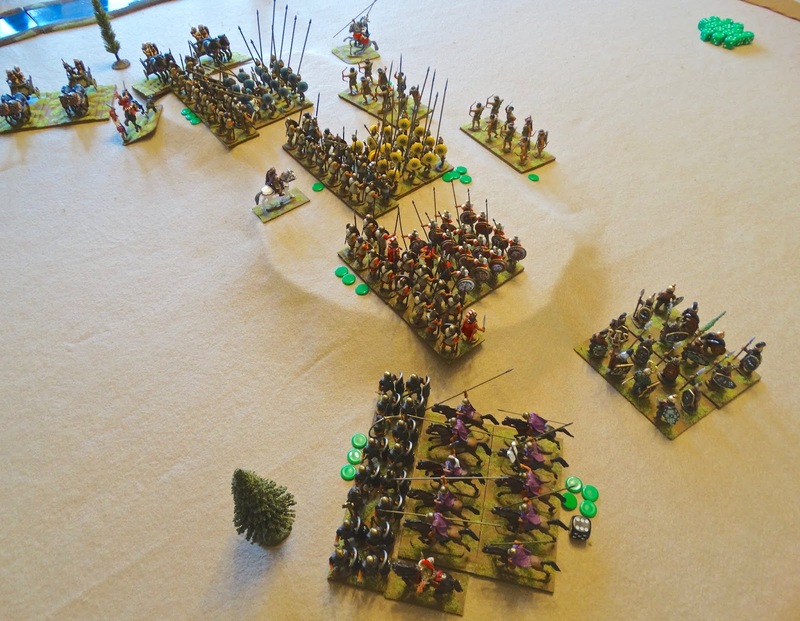 Chariots try to outflank on the right, with heavy cavalry and warband going to the left. but time is ticking by. The Paphlagonian pike phalanxes reach the ridge and desperate hand-to-hand fighting commences. The ambush is almost entirely overcome, but a significant delay has been imposed. but can the flanks hold? but those outflanking chariots are becoming a real threat. although the Paphlagonian Companion Cavalry have been lost in the process. only to find their comrades have already been routed. For me, this was an enjoyable solo game which confirmed that the amendments I was using at least worked, whether or not anyone else would agree with them. At the moment, I am getting considerable pleasure in solo games, which I can set up when I like and play at my own convenience and speed. Doubtless I am turning into an anti-social old bugger. I never bother with any particular refinements to make my solo play more sophisticated. 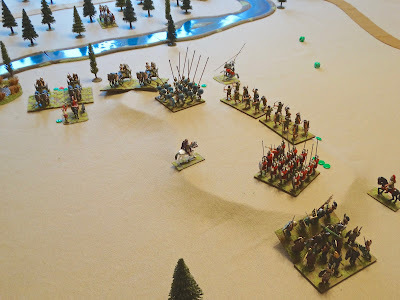 In the words of George Gush, I am one of those players "who play mainly for the interest of seeing the battle unfold before them" - so I find simply alternating between playing one side and then the other from move to move perfectly satisfying. I should start with 2 points - firstly, KoWH has a very limited online presence and I have a suspicion that it may not be very widely played. I hope any of those who do play it may be attracted here, but I accept I may be broadcasting to thin air. Secondly, when I have actually paid for a set of rules, I prefer to play them as written. In the case of KoW I have departed from that principle, but I have at least tried not to alter the spirit of the rules. In this respect, then, I felt the strict IGO-UGO concept needed to be retained - but with one important exception. I couldn't in the end resist putting in a simple 'evade' rule, as without one I felt period feel was significantly compromised. Evading is available to skirmishers, individuals, and units with the 'nimble' special rule. Such units are allowed to move away when charged. 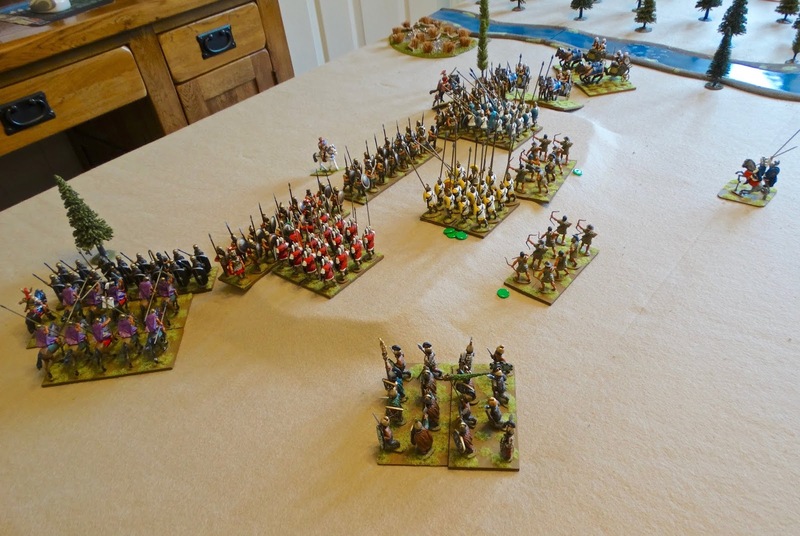 Other gamers find the IGO-UGO format rather too restrictive - check the comments from Jim Webster on the Society of Ancients forum if you are interested in alternative ideas. I have also added a simple command and control mechanism, based on the old 'command radius' idea. Units out of radius of their generals need to roll to make moves towards the enemy. I have also restricted the 'double move' idea - these can only be made when no part of the move comes within 12" of enemy units. 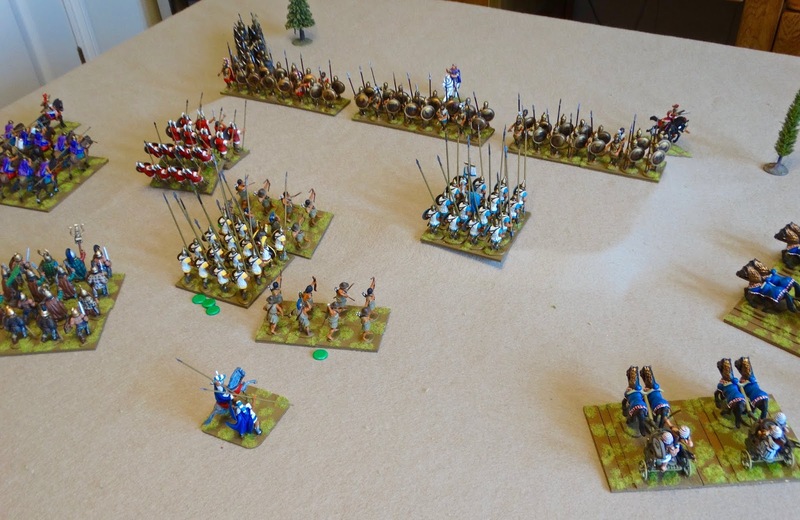 Charges are also altered in a similar spirit - in this case, rather than charging a double move, single moves plus a 'charge bonus' are mandated, the bonus being 2" for infantry, elephants and cataphracts, 4" for everyone else. Difficult terrain and obstacles are now crossed at half speed. A few new Special Rules have been introduced. 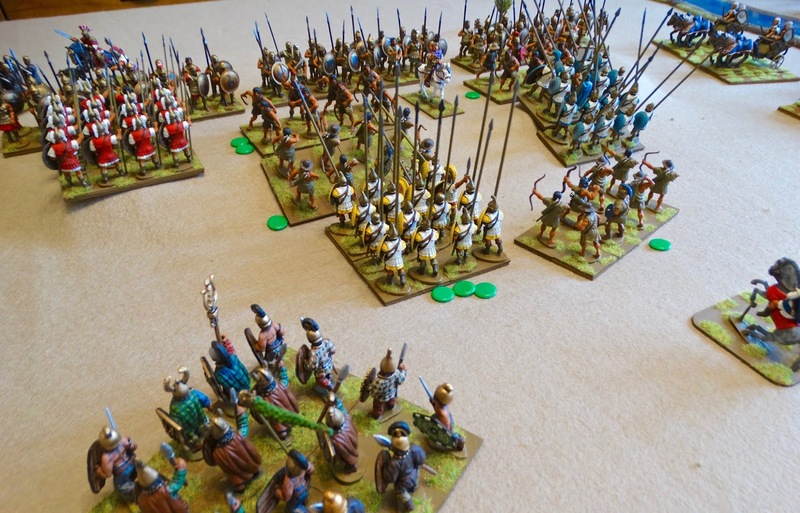 Most heavy infantry (particularly hoplites and pikes) suffer from the Inflexible Charge rule, which prevents them from pivoting during a charge move. This seemed like common sense. Before the KoW forum was taken down, there was some discussion about the rather over-powerful nature of elephants, and I agree with this view. I have therefore introduced a Stampede rule for elephants, which sees them having a chance of charging off randomly if they are 'wavering' or 'routed'. I have also tweaked down the 'nerve' values of elephants, making them easier to waver or rout. On the subject of tweaking stat values, this approach is both a blessing and a curse. It makes for a simple and flexible way of adjusting the effectiveness of units in accordance with one's historical views, but the rules lack any background on the basis for the various stats. Altering the points values of units as you alter the stats is tricky for the same reason - the method for deciding points values is not given and the process is completely opaque (not to say rather incomprehensible when various points values are compared). I think the fighting of melees is a strong point of the rules. However, whilst you can attack a single unit with more than one of your own units, you can only engage one enemy unit at a time - so if your attacking unit overlaps a second opposing unit, this has to be 'nudged' aside. 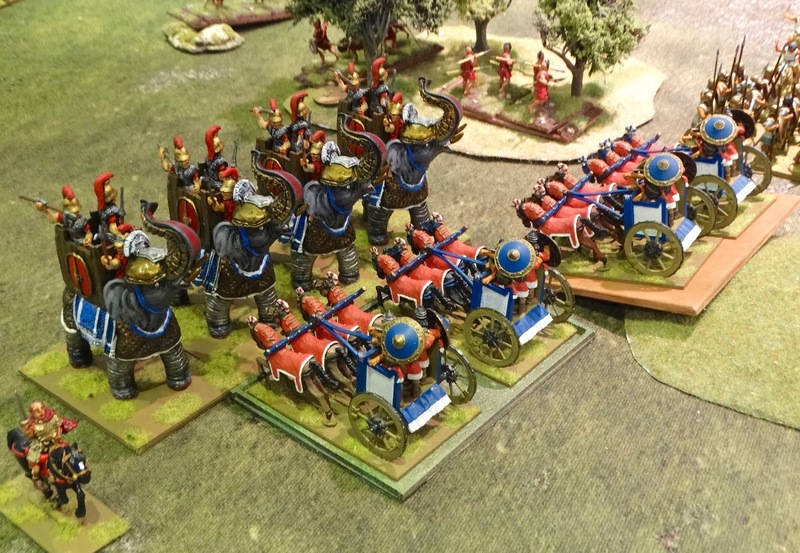 In the first battle described above, the heavy chariots fighting the elephants were in 2 units of 2 chariots each. The 4 attacking elephants were in one unit, and therefore could concentrate all their attacks on half the opposing force, destroy them, and then move on to the other half. This doesn't make much sense to me. Stuart tells me this was done for simplicity in melee calculations, but I am prepared to accept one or two more simple sums for a better representation of combat. In my amendment therefore, if you charge and contact more than one enemy unit, you have to fight all of them. There are a few more changes in my lexicon, but I think that will do for the moment. As I mentioned, I have a strong suspicion that these comments will have a rather limited audience. Apologies to those for whom KoW Historical are of no interest. I am enjoying playing them immensely, and I am hoping that some players of the rules may be attracted to this blog when they search the rules title. If that is you, please make contact in the comments section. I think the most important thing is that you've found a set of rules that you enjoy for the Ancients period and that is all that really matters. I think we all tweak rulesets here and there to suit our own interpretation of how units, weapons etc performed. Others may disagree, as is their right. Personally I'm really enjoying Bob Cordery's 'The Portable Wargame' at the moment as they give me a nice and simple set of rules, but with enough challenges and decisions to make to provide a good game. So this evening I was able to set up, play the game and take it down, all within less than an hour. And I enjoyed the game. Given my general lack of gaming time these are perfect for me. By the way, both games looked really good:). Fun games! Which is of course the point. If one's choice of rules do that, that's at least half the battle, if you'll excuse the expression. I am finally getting my own (Really?) five core rules nailed down, although I must admit that they owe much to Mr. Featherstone and other early proponents of the hobby. There's an un-official variant for TYW/ECW that I played with a friend of mine a short time ago. It does work but it's a bit quirky. I'd use it again for fast, simple one-off games. Thanks for taking the time to give a considered view of the rules. I have them on the shelf ... where they have stayed! I will at least take them down now and have a browse. I do agree with your observations about 'ganging up' in melee. I would much rather see a system that has a one on one resolution, with additional units acting as supports. Keith - I have the strong feeling that KOWH was something they did as people wanted to use their historic armies and currently in the KOW fantasy system they would all fall under one human army list, which is basically medieval. I think its essentially an orphaned project they are nt planning to develop. So...they might be up for someone else developing it further or doing one of their Clash of Kings style annual supplements. They appear at quite a few shows in our area and always seem up for a chat about their games. Might be worth a chat when you next spot them to get more background on the system / your thoughts on KOWH. Thanks Stuart. I'll keep an eye out for them. I have a lot of respect for Mantic, not least for the amount of free stuff they offer. I think that your original idea to write your own rules would be better then to change again and again rules which are more or less not to your taste. In my opinion all your amendments create a different game then KOWH. Or to say it in different word: your result is the same like many rules, which use for example the "engine" of Black Powder/Pike & Shotte etc. by Warlord, but include aspects from other rules (Cards to activate Units etc. like Kugelhagel). 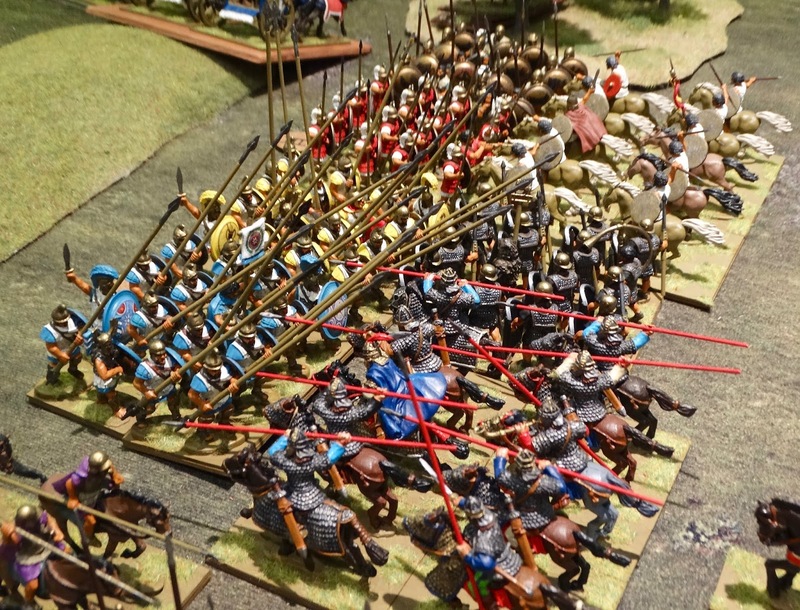 Personally I have a large collection of figures for ancient warfare (early Romans) but as more I learnt about ancient warfare, I felt that it is very difficult to reflect the style of fighting even if you use two similar armies - Spartans vs Thabian. Both of your games are looking great. But I prefer the second one. I don't like those frontal affairs, as you know. I hope you enjoy Ancient warfare nevertheless and I hope to read more about your rules.